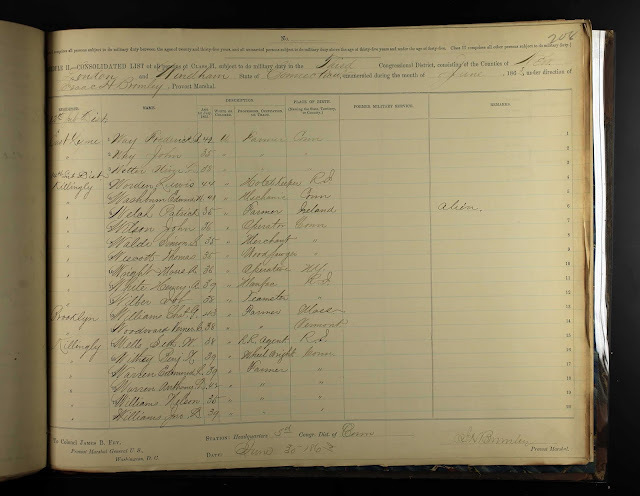 Yes, I know it's supposed to be Treasure Chest Thursday, but I can't help it - I want to share some of the records that I have found in my repository and online searches for my ancestral families. "Schedule II. Consolidated List of all persons of class II, subject to do military duty in the Third Congressional District, consisting of the Counties of New London and Windham, State of Connecticut, enumerated during them onth of June 1863 under the direction of Isaac H. Bromley, Provost Marshal." * Place of Birth: R.I.
"U.S. Civil War Draft Registration Records, 1863-1865," digital image, Ancestry.com (http://www.ancestry.com), Connecticut, 3rd Congressional District, Vol. 2 of 2, page 208 (image 211 of 219), Henry A. White entry. Henry A. White was on the Class II list of all persons subject to do military duty. All of the persons on this list were between the ages of 35 and 45. To my knowledge, Henry A. White did not serve in the Civil War.